The Muslim world is currently experiencing unprecedented persecution at the hands of fringe, extremist, ideologically-driven, groups. Whether it is Boko Haram in Nigeria, al-Shabaab in Somalia, al-Qaedah in North Africa and Arabia, the Taliban in Afghanistan and Pakistan, and ISIS in Syria and Iraq, mainstream Muslims, from all the major and minor schools of law and spiritual paths in Islam, are being targeted by violent militants who view them as infidels and apostates whose blood can legally be shed. Although these terrorists also target non-Muslims, the overwhelming majority of their victims are traditional Sunnis, Sufis, and Shi‘ites, all of whom profess that there is no God but Allah and that Muhammad is the Messenger of Allah, believe in the foundations of Islam, observe the branches of the religion, and therefore are Muslims. With the exception of some misguided souls, no Muslim can identify with any of these mercenary movements that pretend to be fighting for Islam and the Caliphate. As their ideas and actions make manifest, these death cults are the antithesis of Islam and its diametric opposite. In fact, they relish the fact that they violate Islamic legal, moral, and ethical norms and take pride in attributing their actions to the Muslim faith, thereby soiling the image of Islam, inciting a backlash against believers on a global scale, and justifying foreign intervention in the Islamic world. How, then, has a religion of beauty been rendered so ugly? For those who may have forgotten, Muhammad, the Messenger of Allah, may peace and blessings be upon him, was a gentle, caring, and tender man with a message of love. The most beautiful of all beings, his soul was pure, clean, and spotless, shinning with spirituality. His primary approach to spreading Islam was preaching and setting an inspiring example. When attacked, he defended himself, but was also just and equitable. If he ever waged war, it was to liberate, not subjugate, and to bring justice instead of injustice. Like Allah, the Prophet’s mercy prevailed over his wrath. If God has given us the Qur’an, He has also given us the Sunnah, contained in the Hadith and Sirah; in books of tradition as well as history and biography. Although ignored by the majority of Muslims, one of the most important aspects of the Sunnah consists of the letters, treaties, and covenants between the Messenger of Allah and communities in and around Arabia. It is in these sources that the vision of the Prophet Muhammad is the most clearly and meticulously articulated. How does one spread Islam? How does one treat non-Muslims? Every aspect of the Prophet’s domestic and foreign policy is to be found in the covenants he concluded with the Christians of the Sinai, Egypt, Najran, the Levant, Assyria, Armenia, Persia, and the World. These documents stipulate the rights and obligations of both Muslims and non-Muslims, enshrining freedom of belief, religious practice, property, life, honor, and dignity. The Covenants of the Prophet Muhammad were respected by the rightly-guided Caliphs as well as most of the Umayyads, the ‘Abassids, the Ayyubids, the Mamluks, the Safavids, and the Ottomans. Renewed on a regular basis for nearly 1400 years, the Covenants of the Prophet formed the basis of interfaith relations in Islam. As a result of the conditions of social justice, stability, and fraternity that they created, the Covenants of the Prophet played a major role in the rise, spread, and success of Islamic civilization. Since nothing but Allah lasts forever, it was willed that Islam would gradually come to fade as a World Power. The reasons for this decline are complex; however, a major reason for the decay and downfall of Islamic Power was the failure to follow the true, traditional, understanding of the Qur’an and the Sunnah, including casting aside a major part of the latter, namely, the Covenants of the Prophet Muhammad, peace and blessings be upon him. The Covenants consist of official documents recording the words of the Messenger of Allah issued during his lifetime. Not only do they possess authority equal to canonical traditions, they surpass them in established authenticity since they derive from chains of written evidence stretching back to the first days of Islam when the Prophet was still issuing treaties, letters and edicts. And given that Muhammad identified certain of these documents as having been inspired and commanded by Allah himself, their authority is comparable to that of the Qur’an and the sacred sayings. Since they confirm, as opposed to contradict, the Qur’an and the Sunnah, they can serve as a source of legal guidance and inspiration while showing the true spirit of Islam. If they were once commonly known to most educated Muslims and Christians, the Covenants of the Prophet were eventually forgotten, hidden, and deliberately destroyed, during the dark days of colonialism and imperialism. When Muslims finally regained their independence, they followed not Islamic Tradition, but Western political models. Ideologues of all ilks attempted to come up with an Islamic political model from Islamic States to Caliphates. While some have fared better than others, none can be called a success, and most have failed miserably. Invariably, the nominally Muslim models they imposed were often worse than the Western models that they replaced. Although the Qur’an is our compass, the Sunnah is our map. They need to go hand and hand. While many ideologues inspired themselves by both, they forgot the most fundamental part of the Sunnah: the Covenants of the Prophet in which the Messenger of Allah himself provides all of the foundational principles that are to govern Muslims both regionally and internationally. Not only do the Covenants of the Prophet prove the historicity of the Messenger of Allah, they shed an enormous amount of light on the biography of the Prophet, peace and blessings be upon him, and early Islamic history. They demonstrate convincingly that early Islam was inclusive as opposed to exclusive and intended to unite all believers in a monotheistic community; a confederation of Muslims, Christians, and Jews, which was open to other faith groups as well. The Muslim model is therefore one of tolerance and peaceful co-existence. It is therefore a blessing, a warning, and a sign that the Covenants of the Prophet Muhammad have resurfaced at this particular moment in history. It seems that Allah, in His Infinite Wisdom, had delayed the dissemination of these previous manuscripts until the moment in which they were most desperately needed by Muslims. As the written words of the Prophet Muhammad himself, peace and blessings be upon him, and a central part of the Sunnah, they should sit side by side with the Qur’an in both mosque and home. If Muslims are ever to recover the reality of Islam and undergo a collective awakening, these covenants of hope will play a major part in that restoration. While many proponents of Political Islam are well-intentioned, others, of course, are not. Although they are aware that there is a disease affecting the Muslim world, they have misdiagnosed it. Not only have they misdiagnosed it, they have applied a cure that is worse than the disease. The sickness that they see in others is the sickness that they have in their own soul: the disease of extremism. More than ever, Muslims need to become reacquainted with the Covenants of the Prophet as they consist of the best antidote to repel the plague is becoming pandemic in our beloved Ummah. It is in this spirit that I come to Abu Dhabi to present the Covenants of the Prophet Muhammad with the Christians of the world. The disease of extremism is a sickness that plagues the modern world. More than ever, Muslims need to become reacquainted with the Covenants as they consist of the best antidote to repel this disease which is becoming pandemic in our world. 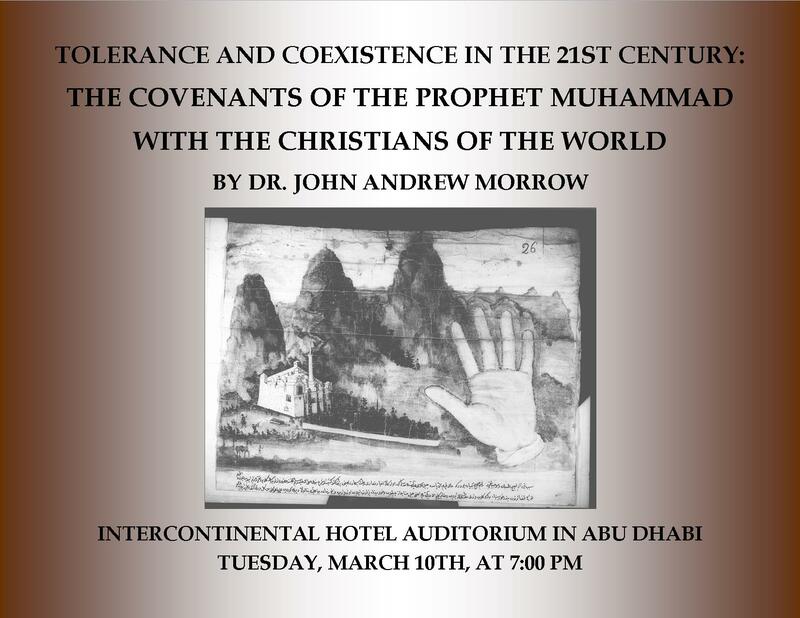 Dr. John Morrow will present a lecture on “Tolerance and Coexistence in the 21st Century: The Covenants of the Prophet Muhammad with the Christians of the World” at the auditorium in the Intercontinental Hotel in Abu Dhabi, on Tuesday, March 10th, 2015, at 7pm. Please keep up the good work you are doing! We need to condemn all forms of violence, committed in the name of Islam, including those targeting Christians. ‘The Covenants of the Prophet Muhammad with the Christians of the World’ represents an excellent initiative…..it needs to be spread widely among those who identify themselves as Muslims as well as our brothers and sisters beyond. Continual ‘high-level’ dialogues and positive interactions with them at all levels is another very important development. too share my familiarity here with colleagues.